Out with old, in with the new. We completely overhauled the connector experience in Office 365 to provide you with better guidance, a simplified user interface and an easier way to check that everything works as expected. This topic digs into all the details, but here are a couple highlights. Depending on your scenario, you may or may not need to set up connectors. Wouldn’t it be great to know up front whether you need to create connectors for your scenario? Since we thought so, we created some guidance and made some additions to the setup wizard to help you along. 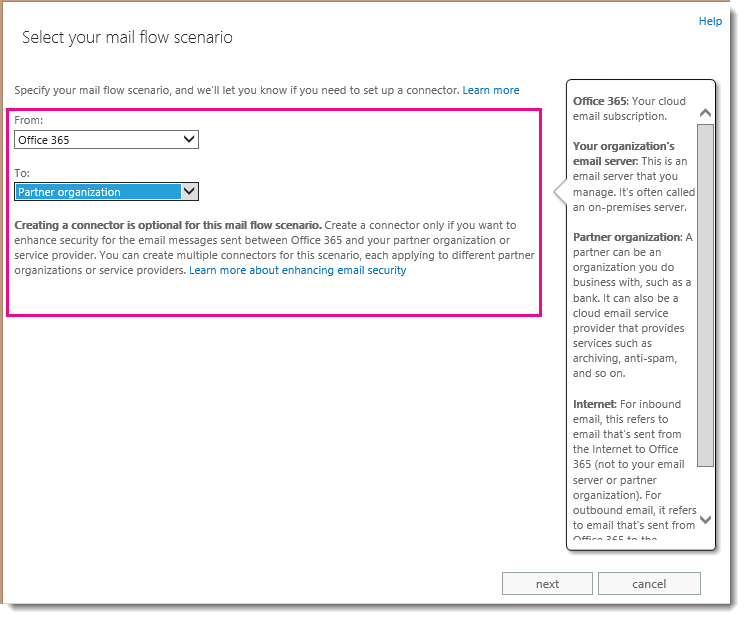 You can start with this TechNet article for a list of the different mail flow scenarios and whether connectors are needed. 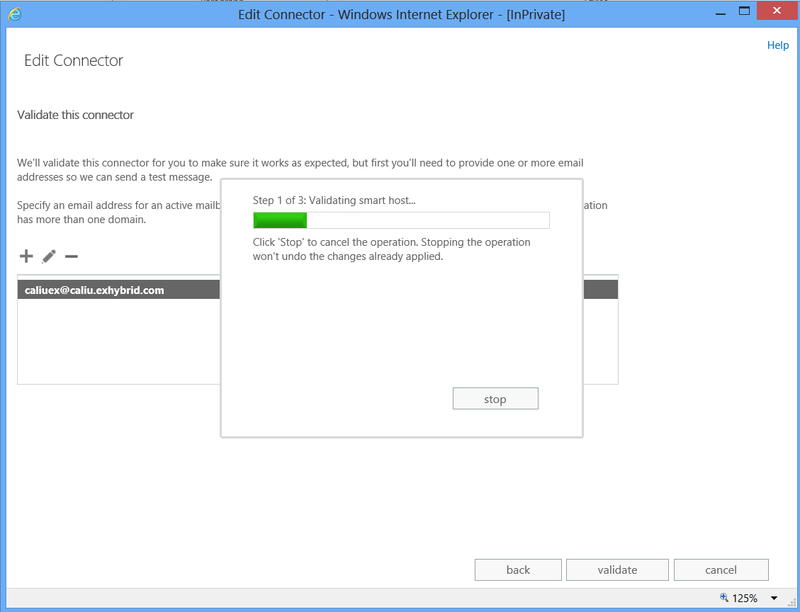 To set up a connector, go to the Office 365 admin center, navigate to the Exchange admin center, click ADMIN and then click Exchange. The connectors tab is on the mail flow page of the Exchange admin center. Once you begin the process of creating a connector, specify your mail flow scenario to determine if a connector is mandatory or optional. 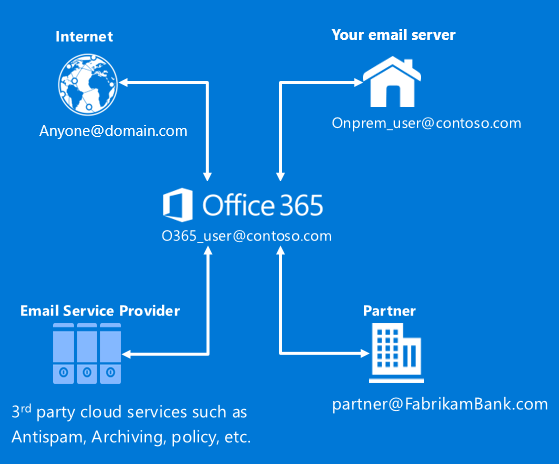 For example, although a connector isn’t needed for mail to flow between your Office 365 organization and a partner organization you do business with, you might want to create one to apply addition restrictions. Previously, you’d create a connector and then cross your fingers that it worked as expected. Give those fingers a rest. You can now validate that a connector works before you start using it. After running through a few validation steps, the results are displayed to let you know if anything needs fixing. And to make sure you’re not left scratching your head about how to fix any problems, we’ve included a link to a troubleshooting topic to help you out. Don’t worry—if you can’t validate the connector right away, you can still save it and validate it later. We’d love to hear your feedback so we can continue to improve your experience with Office 365! Do I need to create a connector?